Analysis: Fresh off his first career Pro Bowl season, Hooper's prospects remain bright heading into 2019 with Mularkey joining the coaching staff. Now studying under a former NFL tight end as well as someone with 14 combined years of head coach and offensive coordinator experience, Hooper looks primed to excel in his fourth NFL campaign. The 24-year-old turned in a 71-reception, 660-yard campaign in 2018 after averaging 34 catches and 398.5 yards per season between 2016 and 2017. Hooper recorded the only touchdown for the NFC during Sunday's Pro Bowl, hauling in a 20-yard Dak Prescott touchdown pass in a 26-7 loss to the AFC. Hooper was named to the NFC Pro Bowl roster Tuesday after Zach Ertz withdrew from the event, Vaughn McClure of ESPN.com reports. Hooper caught five of six targets, accounting for 67 receiving yards during Sunday's 34-32 win against the Buccaneers. Hooper caught both of his targets for 36 total yards during Sunday's 24-10 win over the Panthers. Analysis: Hooper helped tie up the game in the second quarter with a 32-yard reception, setting up a Matt Bryant field goal. It was an otherwise quiet outing for Hooper, who has just three games this season with fewer than three receptions, though two of them have come over the past two weeks. He'll have a chance to rebound in a big way in the season finale against a weak Tampa Bay pass defense against which Hooper collected nine catches for 71 yards and a touchdown in a Week 6 win. Hooper (knee/ankle) doesn't have an injury designation for Sunday's game in Carolina, Vaughn McClure of ESPN.com reports. Hooper (knee/ankle) was listed as limited at Thursday's practice, Vaughn McClure of ESPN.com reports. Analysis: While Hooper is still having his reps monitored carefully, the tight end at least seems to be in better place health-wise than he was a week earlier. Hooper sat out practices last Wednesday and Thursday before returning to work Friday, but went on to play a season-low 34 offensive snaps in Sunday's win over the Cardinals. With back-to-back limited practice showings to kick of Week 16, Hooper should reclaim a higher snap share this weekend in Carolina. Hooper (knee/ankle) was limited in practice Wednesday, Vaughn McClure of ESPN.com reports. Hooper failed to haul in his one target during Sunday's 40-14 win against the Cardinals. Coach Dan Quinn said Hooper (knee/ankle) will play in Sunday's game against the Cardinals after returning to practice Friday, Vaughn McClure of ESPN.com reports. Hooper (knee/ankle) suited up for Friday's practice, Vaughn McClure of ESPN.com reports. Analysis: Hooper sat out the Falcons' first two practice sessions of the week, but it appears he will get some work in Friday, which bodes well for his chances of taking the field in Week 15. His official injury designation for Sunday's matchup with the Cardinals will be revealed after Friday's practice concludes. Hooper (knee/ankle) stretched with the team but didn't practice Thursday, Vaughn McClure of ESPN.com reports. Hooper (knee) isn't practicing Wednesday, Vaughn McClure of ESPN.com reports. 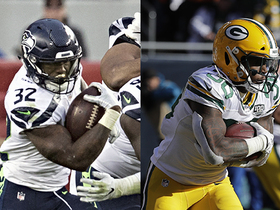 Analysis: Injured in the closing minutes of Sunday's 34-20 loss to Green Bay, the 24-year-old tight end is now in danger of sitting out Week 15 against the Cardinals, though coach Dan Quinn said Monday that Hooper should have a chance to play. No. 2 tight end Logan Paulsen (knee/ankle) returned to practice Wednesday after missing the Week 14 game. Coach Dan Quinn said Hooper (knee) has a chance to play Week 15 against the Cardinals, Vaughn McClure of ESPN.com reports. Analysis: Hooper injured his knee toward the end of Sunday's 34-20 loss to Green Bay, ultimately catching four of six targets for 37 yards across 55 snaps (78 percent). The Falcons believe he avoided a long-term injury, but there's still no guarantee he'll be ready for Week 15. No. 3 tight end Eric Saubert is left as the team's only healthy player at his position, with Logan Paulsen (knee/ankle) coming off a Week 14 absence. Hooper suffered a knee injury in Sunday's 34-20 loss to the Packers, Kelsey Conway of the Falcons' official site reports. Analysis: Hooper limped off the field on the Falcons' final drive of the game and was deemed questionable to return, but with the contest in the closing stages and already out of reach, he never retook the field. 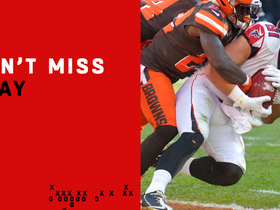 The 24-year-old caught four of six targets for 37 yards, as the Falcons offense struggled to score until the fourth quarter. The specifics of the injury remain unclear, but his status should receive some clarification by the time Atlanta resumes practice Wednesday. Hooper caught all five of his targets, racking up 44 receiving yards and one touchdown during Sunday's 26-16 loss to Baltimore. Hooper caught all five of his targets for 31 yards during Thursday's 31-17 loss to the Saints. Hooper hauled in four of eight targets, picking up 27 receiving yards during Sunday's 22-19 loss to the Cowboys. Hooper caught 10 of 11 targets for 56 yards and a touchdown in Sunday's 28-16 loss to the Browns. Analysis: Hooper did his damage on checkdowns, with none of his catches going for longer than 10 yards. The tight end's three-yard touchdown on fourth down gave his team a glimmer of hope, cutting the deficit to 28-16 in the fourth quarter. Hooper's come on after a slow start, topping 40 receiving yards in each of the past five games after coming up short of 25 in three of the first four contests of the season. You could do much worse at tight end in Week 11 than Hooper against the Cowboys. Hooper hauled in all three of his targets for 41 receiving yards during Sunday's 38-14 victory against the Redskins. Analysis: The third-year tight end has been absurdly efficient over the past five weeks, posting a catch rate of 82.8 percent while averaging nearly 60 receiving yards per game (31.2 yards per game through Week 4). Hooper's involvement in the passing attack has accelerated in 2018, with 44 targets in eight outings, compared to 35 targets at this time last year. 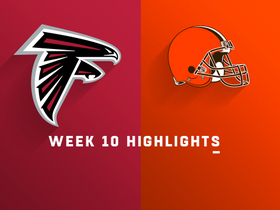 Upcoming Sunday is a matchup against a Browns defense that's surrendered 58 receptions and six touchdowns to tight ends thus far this season. Hooper hauled in three of his four targets, while accounting for 48 receiving yards during Monday's 23-20 win against the Giants. Hooper enters a Monday night clash with the Giants in the midst of a likely soon-to-be career year, with 30 receptions on 37 targets for 273 yards and two touchdowns through six games. Hooper corralled nine of his 10 targets, while accounting for 71 receiving yards and a touchdown during Sunday's 34-29 win against Tampa Bay. Hooper collected nine of 12 targets for 77 yards during Sunday's 41-17 loss to the Steelers. Analysis: The third-year tight end set new season highs in targets and receptions against Pittsburgh, while accounting for his highest output of receiving yards since Week 1 of last season. Hooper feasted on a favorable matchup against a Steelers defense that surrendered more PPR points to tight ends than any other team coming into Week 5. Sunday provides further opportunity for bountiful fantasy production, with Hooper facing a Tampa Bay secondary that's been torched for 9.4 yards per attempt in 2018. Hooper hauled in one of two targets for 19 yards in a 37-36 loss to Cincinnati on Sunday. Analysis: The third-year tight end has now been held to 24 or fewer receiving yards in three of four outings to start the season, and has only eclipsed 50 yards three times in 33 career games. Week 5 does provide some reason for optimism, as the Steelers have allowed opposing tight ends to catch 30 passes for 339 yards and three touchdowns on 42 targets through four weeks. 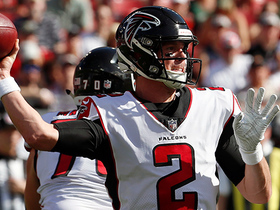 Hooper hauled in three of his four targets for 24 yards, as the Falcons fell to the Saints in overtime 43-37 on Sunday. He also caught a two-point conversion. Hooper hauled in all five of his targets for 59 yards and a touchdown during Sunday's 31-24 win over the Panthers. Analysis: Hooper's performance on Sunday was his most substantial PPR-scoring output since Week 10 of last season (16.9 points). With 59 yards against Carolina, the former Stanford standout also eclipsed 50 receiving yards for the first time since putting up over 100 in Week 1 of 2017. Upcoming for Hooper and the Falcons is a Saints defense that has allowed 663 passing yards during the first two games of the season to Ryan Fitzpatrick and Tyrod Taylor. Hooper (knee) was a full participant in the Falcons' practice Thursday, D. Orlando Ledbetter of The Atlanta Journal-Constitution reports. 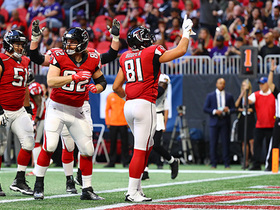 Analysis: Though there hadn't been any reports that Hooper picked up an injury in the Falcons' season-opening loss to the Eagles, the 23-year-old ended up being limited by the knee issue during Wednesday's session. Hooper's advancement to full participation a day later suggests the injury was only a mild concern. Expect Hooper to see ample playing time once again Week 2 against the Panthers after he logged 59 of a possible 70 offensive snaps in the opener. Hooper was a limited participant at Wednesday's practice due to a knee injury, D. Orlando Ledbetter of The Atlanta Journal-Constitution reports. Analysis: Hooper's knee issue comes as a mild surprise given that there weren't any reports of an injury coming out of last week's loss to the Eagles. Should he recover from the setback in time to play Sunday against the Panthers, Hooper could struggle to see much work in the passing game. The Panthers put the clamps on Dallas' short-passing game in the season opener, limiting starting tight end Geoff Swaim to 18 receiving yards. Hooper corralled three of his four targets for 24 yards in Atlanta's 18-12 loss to Philadelphia on Thursday. Analysis: Hooper is a sure-handed target but not an explosive player by any means, as he has now gone 16 consecutive regular-season contests without exceeding 50 receiving yards (averaging 26.4 yards per game during that span). The breakout performance is unlikely to come in Atlanta's Week 2 matchup against Carolina, facing a defense that allowed the fifth-fewest points to tight ends in PPR scoring last season. Head coach Dan Quinn said Saturday that Hooper is improving as a run blocker, Vaughn McClure of ESPN.com reports. Hooper caught both of his targets for 33 yards and a touchdown in Friday's preseason game against the Chiefs. Analysis: Hooper picked up 29 yards to convert a 3rd-and-11 on Atlanta's third snap, then hurdled over a defender for a four-yard touchdown to finish the opening drive. His talent, age and pedigree make him a reasonable candidate for a Year 3 leap, but he may struggle for volume when the Falcons have all their weapons healthy. Hooper was mentioned by head coach Dan Quinn at this week's NFL owners meetings as one player who the Falcons expect elevated performance from in 2018, D. Orlando Ledbetter of The Atlanta Journal-Constitution reports. 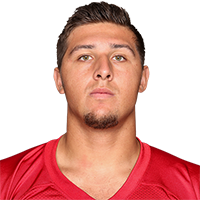 "I'm really looking forward to where Austin Hooper is going to go," Quinn said this week at the NFL owners meeting, "In the run game, he can get better... (but) he's a really committed football guy. I think there will be a big jump." Hooper returned to Atlanta last week to work with Falcons quarterback Matt Ryan at the team facility, ESPN.com's Vaughn McClure reports. Hooper caught one ball for three yards Saturday in a 15-10 playoff loss to the Eagles. Hooper caught three balls on five targets for 15 yards in Saturday's 26-13 playoff win over the Rams. Analysis: Hooper has had between two and three receptions in each of his last seven games, so you know what to expect from him. He hasn't caught a touchdown pass in any of those games, either, so temper your expectations in the divisional round against the Eagles. Hooper caught both of his targets for 12 yards in the 24-21 win over the Buccaneers on Monday. Analysis: Matt Ryan only completed 17 passes on the evening, so Hooper didn't get a lot of looks. He's gone five weeks without a touchdown and would be a risky option in Week 16 against the Saints. Hooper brought in two of four targets for 23 yards in Thursday's 20-17 win over the Saints. 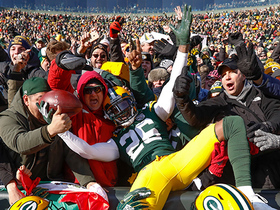 Hooper caught three balls for 21 yards in Sunday's 14-9 loss to the Vikings. Analysis: Hooper's three receptions tied for the team lead, which speaks to how ineffective Atlanta's passing attack was on the day. A bounce-back isn't likely Thursday versus a Saints defense that has given up only 3.3 receptions per game to tight ends in 2017. Hooper brought in three of five targets for 38 yards in Sunday's 34-20 win over the Buccaneers. Hooper nabbed all six of his targets for 49 yards and a touchdown during Sunday's 27-7 win over Dallas. Analysis: Hooper helped cap off the romp early in the fourth quarter with a one-yard touchdown grab, his second in three weeks, after battling through a five-game scoreless streak earlier in the season. Most of Hooper's work takes place underneath as he's averaged just 8.7 yards per catch from Week 2 on. Still, it's a positive sign that Matt Ryan is looking more frequently toward Hooper, who has been targeted at least six times in five of his last six games. Hooper caught three passes for 36 yards in Sunday's 20-17 loss to the Panthers. Analysis: While his final line may not be too impressive, it is encouraging to see that Matt Ryan targeted Hooper six times on the day. Outside of Julio Jones who saw 12 targets, Hooper was the most thrown to Falcon on the day. Green Bay Packers cornerback Bashaud Breeland intercepts Atlanta Falcons quarterback Matt Ryan and returns the interception for a touchdown. 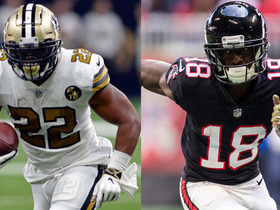 The "NFL Fantasy Live" crew tells you which players you should start and which you should sit in the Week 12 matchup between the Atlanta Falcons and New Orleans Saints. 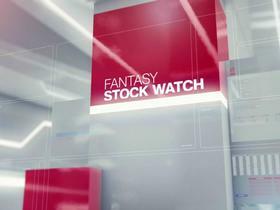 The "NFL Fantasy Live" crew discuss whether or not certain players' fantasy value is rising or falling. 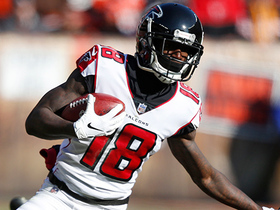 Atlanta Falcons wide receiver Calvin Ridley breaks free for 31 yards. 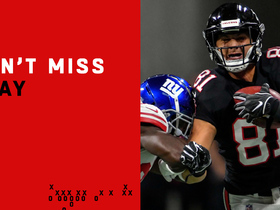 Atlanta Falcons tight end Austin Hooper catches 36-yard ball over New York Giants cornerback B.W. Webb.